If you read here often you will remember my recent post “Cant stop raving about Tiger Tiger Indian Sauces” where I gushed on about Tiger Tiger’s delightful sauces that transform mundane meats like boneless chicken breasts into a delicious meal that explodes with Indian flavors. Please note that I have done some extensive linking through out this post to help you understand the various mentioned Indian dishes. Be sure to click through to those pages (mostly the wiki) and learn about those traditional Indian foods which are new to you. Quite unexpectedly this last Friday, I received the cookbook Modern Indian Cooking by Hari Nayak and Vikas Khanna for review. These two Indian chefs have become known here in the US and abroad for their individualistic takes on Indian cuisine. These two fellows are not only chefs who have made the big time in New York, they are philanthropists who started “Cooking For Life” after 9/11 (their restaurants were near Ground Zero). You can learn more about “Cooking For Life” and it’s important mission by going to the Cooking For Life site. 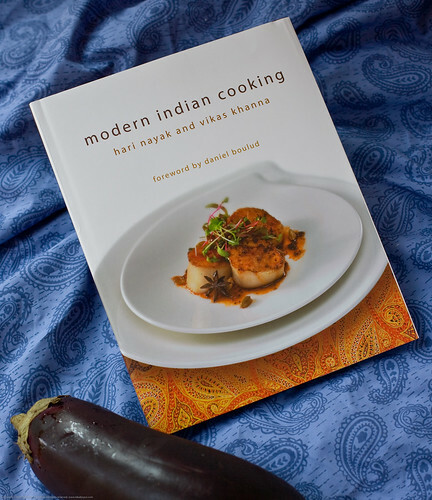 The premise of this cookbook, Modern Indian Cooking, is not to provide traditional Indian recipes but rather to guide the non-Indian into a bright and delicious world of Indian spices and dishes that hearken back to traditional ideas without copying them wholesale. If you are looking for The Authoritative Guide to Indian mother cuisine and technique, this is not the place to find it. What this book gives the reader is a multi-layered high quality experience. The photography is an effortless thing of beauty. You will be drawn into each page with such force that you may simply sit with the book for a hour or two simply reveling in the photography. The forward by Daniel Boulud serves to frame the reader’s mindset, guiding the reader toward the intent of this Modern Indian approach. 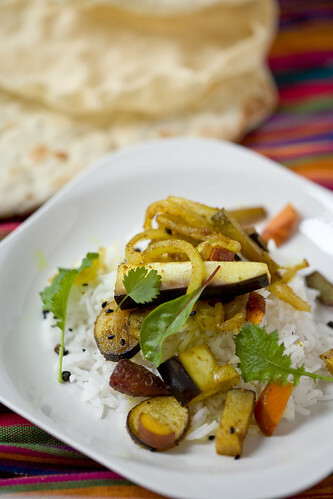 Specifically, this is to view Indian food as approachable and open to interpretation and experimentation. Whereas we Americans have been introduced to the first generation of commercial Indian food (northern and southern), it is time for the next derivation, the offspring of the joining of the Indian mother cuisine with the modern sensibility of fresh and mutable ingredients. I love sambar, masala dosa, idli, and paratha as much as the next person but I do not always get a chance to eat South Indian food (I seem to live in a South Indian Food-free region, wholly devoid of all dosa). I have generally felt intimidated by the large and complex universe of Indian spices and their modes of use. Nonetheless, I adore the entire experience whether it involves a palak paneer, a dosa, a sambar, or a simple pakora. (I see a road trip to Boston in my near future, Central Square here I come). I suggest trying a recipe at a time and not for a dinner party but for you and close loved ones to try and critique. I suggest buying only a small amount of a few key spices and not the whole kit and caboodle all at once. I went to my local big box grocery store (would have gone to Whole Foods if it were not 70 miles away) looking to see what paltry selection of spices they had. I found a SMALL bottle of McCormick’s cardamom seeds for $12.00. I laughed and laughed and then walked away morosely. The only tamarind I could find was tamarind nectar in the Goya section. I need the paste! I came home with nothing and then put together the dish you see in this post. What I did do was peruse Modern Indian Cooking, drank in it’s free spirit, and gave a go at doing what I could with what I had on hand. What follows is what we got. It was delicious! I will be going to Central Square to buy a small selection of spices so that my next time with this cookbook will be more adventuresome. Prepare basmati rice and hold warm. In a dry pan, dry toast the peppercorns and sesame seeds, set aside. Add a tablespoon or so of organic coconut oil to a medium heat heavy cast iron pan (you may need to add more later because eggplant is like a sponge). Add thinly sliced onion, turmeric, cumin, coriander, sea salt, carrots, beets, peppercorns, and black sesame seeds. SautÃƒÂ© until onion is translucent but not brown or charred! 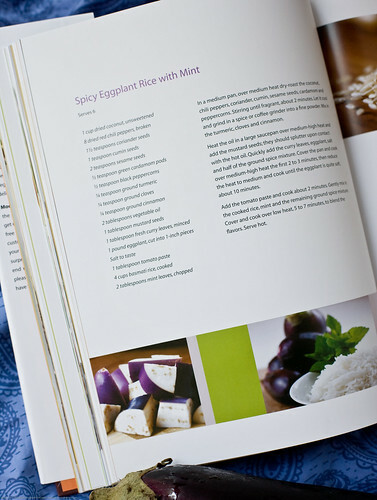 Add cubed eggplant and cook until the eggplant is as soft as you like it and it is well coated with all the spices and coconut oil. Serve over the basmati rice and then sprinkle with a few more peppercorns and sesame seeds and a few well placed microgreens. 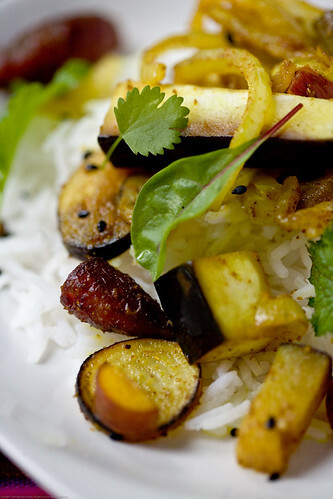 I’d probably have to make this spicy eggplant a wee bit spicier, but it looks delicious. And thanks for bringing this wonderful cookbook to our attention. Cannot wait to try the recipes from this book. Thank you for the post. Lydia: amen, this would almost be the anti-spiced eggplant I am working on my youngins to get them to eat the heat but the oldest one (10) and the husband do not get into it. The 4 year old and the 11 month old seem to like some heat so atleast I can work on them! Suchitra: If you have the time, stop back by and let me know what you tried and if you liked it! Thanks for stopping by. It was fantastic to get a chance to meet you up in VT this last Tuesday. Sorry I was so darn busy, would have been nice to have had a chat. We will get together another time! I will definitely take a second look at Penzey’s. Its been like a year or so since I last cruised there. That meal in your blog post sounds simply amazing! I really need to get myself a meat grinder of some sort. I want to make some colombian salchichas (chorizos). It was my pleasure meeting you. I will follow up on that children’s story business we talked about. Now as to grinders – if you already have a Kitchen Aid mixer, their grinder attachment works quite well. In addition, once you have that, you can add their sausage stuffer easily. I haven’t tried salchichas, but I do a Spanish sausage called butifarras pretty regularly with good results. One Colombian specialty we do make around here though it doesn’t involve the grinder is arepas – my wife was in Colombia for two years with the Peace Corps and for some reason arepas are the one food she pines for from her Colombian experience. It sounds like a neat project, am definitely interested. I do not have a Kitchen Aide .. maybe the Great Pumpkin will bestow me with such gifts *winks*. I think that colombian sausages are similar to basque sausages but I am still trying to find that out for myself. If you are a sausage-geek let me know! I absolutely want to explore the linkages between the lacto-fermented sausages of the region of Colombia that my family comes from and the Basque region. Nika, where do you eat in Central Square? Erwin: I remember this tandoori place. I am actually thinking more about the store there with the spices in the front and the food out the back (walk in take out).. and you? I think the place you’re thinking of is Shalimar India Food. I am actually in the process of discovering the local restaurants…I just moved to the area. I recently enjoyed the food from Haveli, which is closer to Inman Square.